It's so much fun when you cook with just a few ingredients you have left around and the meal turns out looking and tasting great. 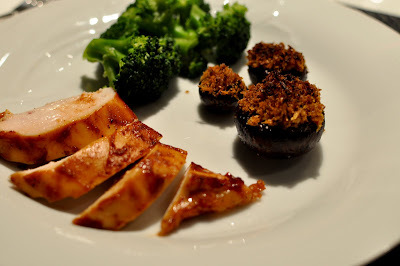 The BBQ chicken was moist and tender; the stuffed mushrooms were crispy and meaty; the broccoli was well, healthy. - baby bella mushrooms (cremini), washed and cleaned, stems removed. 3 to 4 per person. Marinade the chicken in the BBQ sauce for an hour or so (don't worry if you have less time). Pre-heat the oven to 375 degrees. Bake the chicken on a broiler pan (covered in aluminum foil to ease clean-up) for about 20 minutes. Half way through the cooking time, brush some more BBQ sauce on the chicken breast. In a bowl, toss the mushrooms in olive oil and season with salt and pepper. On the same broiler pan as the chicken, cook the mushrooms for 6 minutes per side. They should still have some structure, but you should also seem some juices. While the mushrooms are cooking, toss the breadcrumbs, tarragon, chili powder, paprika, salt and pepper with olive oil in a bowl. In a saute pan, toast the breadcrumb mixture over medium heat until the mixture is slightly browned. Remove the mushrooms from the oven and add the breadcrumb mixture to the bowls of the mushrooms so there is a slight heap of breadcrumbs. Steam the broccoli florets for 5 to 7 minutes until cooked, but still firm. When the chicken is done, remove the chicken from the pan to rest, turn the oven to broiler, and put the mushrooms on the pan in the oven until the breadcrumbs are crispy and brown (just a few minutes).